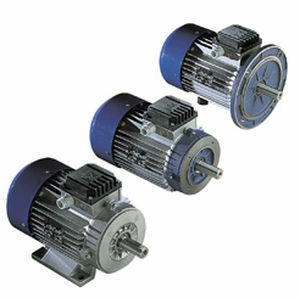 The motors of the SM series feature closed construction with fan cooling and IP55 protection standard. These units are equipped with high thermal reserve (class F insulating materials as standard and Class H per request), and capable of reliable operation even when overloaded. They can be supplied by the inverter, and feature excellent quality insulation between windings, complemented by high level rotor balancing and double rubber screen bearings (2RS). The materials used in construction include aluminum (for frame sizes up to 132 and shields and flanges up to size 90) and cast iron (for frame sizes over 132 and flanges and shields between size 90 and 225). In addition, the shaft can be manually rotated (using Allen key), due to hexagonal hole at the N-Drive end.